Legs height adjust from 16" to 18"
Frame is lightweight & durable. Sturdy, lightweight, frame resists rusting. Rubber feet grip even wet surfaces. Dual cross brace for extra stability with durable welds. High-strength aluminum frame to prevent rusting. Swivel seat turns 360° and locks every 90° allowing easy entry and exit. Adjustable height to fit individual user. Option for Wide Cut Out and space underneath the swivel seat for easy personal care. Strong and durable aluminum frame. 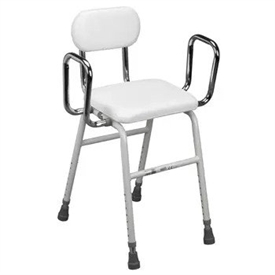 Shower chairs are widely used in multiple places such as nursing homes, hospitals, clinics, and even in the home. Shower chairs are not damaged by water and are used as a disability aid for bathing. Whatever your need, the proper chair can make bathing simple again.